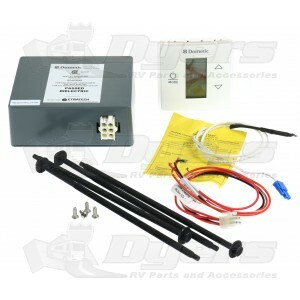 Dometic technology puts total RV climate control at your fingertips. A Capacitive Touch Thermostsat. The Single Zone LCD Thermostat operates automatically or manually and is the perfect choice for standard or ducted rooftop units. Comfort and control come together in one superb package. The Dometic Single Zone LCD Thermostat lets you control all interior heating and cooling from one convenient, easy-to-use location. - Furnace mode lets user select 1°/2° on/off differential. - Open back for pull through wiring. - Back plate with two screws. - Snap in display cover. Single Zone LCD Thermostat easily functions up to 75-feet away from the air conditioner. Large LCD display is easy to see and use even in low light. Compact, low profile complements any interior. Digital calibration for consistent room comfort. Seven segment LCD numbers and letters improve viewing. Green LED indicator shows operating mode. Easy touch click response buttons let you know when you make a change. Displays set temperature, actual temperature displayed on demand. Memory retention — in case of power loss unit returns to previous set points. My Dometic control kit was not working good, so I bought this to replace it. Easy to install. Item as described .Works perfectly! The thermostat works as advertised. It came with accurate wiring instructions. I'm very pleased.